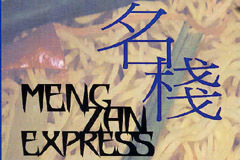 Meng Zan Express offers you traditional and modern interpretations of the most diverse and imaginative cuisine. Our menu has an extensive variety of dishes freshly prepared to exceed todays requirements of healthy dining. Meng Zan offers exciting and authentic Chinese and Oriental cuisine. Any dishes not featured on our menu can be requested - please ask. Open every day from 5.30pm-11pm for take-away and home delivery. Free delivery for orders over £10.00. Parties and functions catered for. A range of authentic Chinese and Oriental dishes as well as Szechuan Special Dinner at �10 per person (2 or more) and Meng Zan Special Dinner at �11 per person (3 or more). Our range of Chef's Specials includes Rainbow Crispy Shredded Chicken with Chilli, Meng Zan Port Fillet, Chin Yim Squid and Double Cooked Pork - see our menu pages for full details.